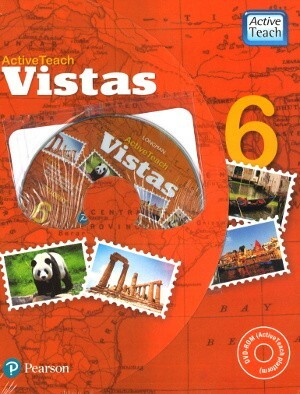 Pearson Active Teach Vistas Class 6 - The content is graded as per the latest NCERT guidelines and presented in an attractive layout, Maps, images and figures supplement in text and in-box description of a few subtopics facilitate deeper understanding. ActiveTeach Vistas 1-8 is an integrated social science series, based on the latest National Curriculum Framework for School Education as well as the CCE guidelines. The content is graded as per the latest NCERT guidelines and presented in an attractive layout, Maps, images and figures supplement in text and in-box description of a few subtopics facilitate deeper understanding. The exercises have been structured very carefully in order to assess the learners on myriad skills. There are subjective and objective types of questions, questions to explore higher order thinking skills, drawing skills, project skills as well as the important life skills. At every stage the learner is invited to participate, so that he/she can imbibe the lesson whole-heartedly. The AT platform runs on Windows, Mac and Linux operating systems. Active Widgets include easy to use tools such as Our India (classes 1 and 2), Calendar and World Entities (classes 3 to 8). Dynamic Question Zone helps generate complete question papers for Formative and Summative Assessments. Assets include chapter objective, lesson plan, worksheets, animations, games, videos and video worksheets, interactive activities, problem-solving assessment and answer key.